The Game Master’s Guide gathers all the Game Master information from the Warhammer Fantasy Roleplay Core Set, as well as the rules for Corruption, Mutation, and Disease from Winds of Magic and Signs of Faith, and presents them in an easy-to-reference hardcover book. Featuring clarified and expanded rules, this Guide contains nearly all the information from the Tome of Mysteries, Tome of Adventure, and Tome of Blessings from the Core Set. While it also includes the rules and mechanics for corruption, mutation, and disease, players can still find all the background information on magic and faith in the Old World in the Winds of Magic and Signs of Faith expansions, respectively. 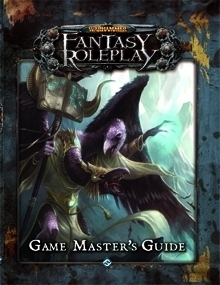 The Game Master’s Guide is available at RPGNow.com.